Member of Florida Pest Management Association (FPMA) , National Pest Management Association (MPMA), Certified Pest Control Operators Association of Florida (CPCO), Termidor Certified Professional, Home Advisor Super Service Award Winner and Top Rated Pest Control Services in the Tampa Bay Area & Home Advisor screened and approved. 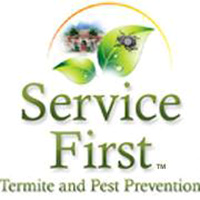 At Service First Termite and Pest Prevention™, we are committed to providing high quality service that is guaranteed! Our trained technicians are certified through the State of Florida and are continually trained on the latest techniques and treatments for your home or business. We offer high quality, reliable, and affordable service and we use products that are friendly to the environment. Every customer receives a customized treatment plan to correct the problem so you can get your home back from unwanted pests! I had been fighting honey bees under my shed with everything I could think of. I had three estimates. Service first had the best price, the fastest service, and the best guarantee. He came out for an estimate and sprayed the same day. So I also signed up to have my house sprayed every three months. They sprayed inside and out. The others wanted to spray outside only. I was very impressed with the overall. Experience. Great service! Daniel is very professional, respectful and thorough. He listens to my concerns and takes care of the problem. He always reassures me that if I need anything between services to give them a call and they’ll be right out to take care of it. Highly recommend! Great people! Always concerned and caring to offer their finest service. Just contact, make an appointment. They will always be on time to assist you with problems you may have encountered in or outside your home. I was happy with your service. You were on time and very proffesional on the phone and Danny was very knowledgeable and professional on site. So far I have no complaints on your service or company. I am happy with my service. It’s always the same technician that comes out to service my home. I have been a customer for 3 years and have no complaints. If I see any bugs between treatments, they come right out when I call. I’m very happy with their professionalism and services. Excellent service! No more roaches! good service buy annoy you with surveys. I love this company always top notch service. They’re very friendly. Daniel was our service rep. He was polite and did a good job ridding us of the squirrels in our attic. Always on time. Phone calls prior to coming to the house. We would recommend your company to everyone. We have used Service First for four years and their name says it all. Professional, thorough, friendly. We will continue to use them for our yearly inspection. Recommend them. I should have asked for help years ago with an attic rat problem. My solutions were not enough and I worried a lot about it. The Service First technician was very professional and thourough and now I have a 1 year warranty on their work. Peace of mind.Chris. Very professional price comparable to others. Great customer service. The technician is very responsive but most important very respectful. We are very happy with Service First. Their representatives are friendly and thorough. If you have any problem areas, the give extra attention to them. They will help you figure out what is causing a problem and gladly come out as many times as you need them to fix a particular problem. We highly recommend them!!! So far so good. Hopefully they call to schedule the 30 day follow up service I’ve already paid for. Service First is absolutely the best you can ever have. I have been with them for more than 6 years and would go without if I could not use them. I promise if you use Jared and Service First you will never ever consider anyone else. They do it right the first time and every time. john hartley. Always helpful and friendly and knowledgeable about what they do. Thanks for getting rid of my pests! Great service technician also friendly and helpful. I’m very happy that most of the bugs are gone especially in my kitchen I know that when he comes back the second and third time they will be gone thank you. Great customer service from all their team members. On Line, service tech's everyone is so helpful. Recommend this team to anyone who needs their help. Very prompt friendly professional service. My wife and I wish all other businesses that we have dealings with acted at the same first class level that Service First does. The name says it all. We now have three properties that Service First provides insect eradication and protection for. We are satisfied. Only been at my business one time so far but, did do a thorough inspection and provided insight on the total service we will receive. Very happy with the service. Very friendly staff. Very prompted and informative of the process. Provided excellent customer service. I am very happy with their service. Since I have them service my home I haven't had any problems again! Great Service. Easy to work with. Attention to detail. I am very happy with Service First. I recommended them to my ex-husband and they treated his house too. Used for quarterly prevention & termites. Great service! Follow ups & maintenance completed professionally & prompt! Would recommend to everyone! Excellent service. Didn’t have to miss work for the inspection. Realtor met them and their office called me afterwards for the payment over the phone. Thank you!! Very happy with the services you have provided for our company . We have never had a complaint your always prompt and prices very affordable.